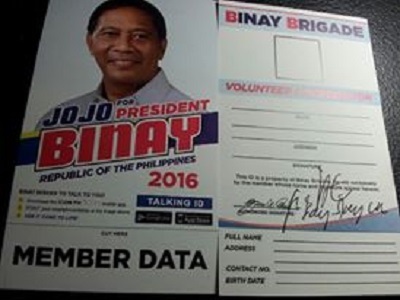 There’s no bragging about it but the Binay volunteerism is up in the air. This is contrary to the accusations that pro-Binay voters are being paid for or “Binayran”. However, we choose our candidate very well and this is how Binay Brigade secure Binay’s votes during election – and at the same time make sure that Binay’s political platform is implemented through educational, medical,economical, social and other forms of public services when Vice President Jejomar Binay assumes office as the President of the Philippines after May 9, 2016, God willing! Binay’s promise to adapt the privileges of Makati residents to the whole country should start taking place when he settles down in the highest office. Our Pro-Binay social media groups will continue to be operated as our commitment in covering the alleviation of poverty nationwide. Freedom of Speech (The Big One) will feature updates on Binay’s presidency, projects and other activities for nation building – and will share with other feasible social media groups pro Binay or not as long as the channels are still active. Do note however that this is not a public service provider mechanism and only an outlet for information dissemination so, solicitations will not be entertained. Contact your Binay Brigade Volunteer Coordinator now to register or email elenagraceflores@gmail.com with your name, address, contact number and birth date with screenshot of your voter’s ID or Biometrics. Let’s go for the win…Only Binay! Next post: Now we Know: Mamasapano Delayed as Poe awaits Pnoy’s endorsement – RoRo out? Taga Makati ako. Solid Binay kami.